Pongwiffy has it all...a hovel of her own, a sometime-friend named Sharkadder, and an odor only a witch could love. Everything is almost perfect -- until a gaggle of Goblins move in next door. Heavens above, they're enough to wake the dead. It's time to move. But where? And where will she find a much-needed assistant? Sharkadder persuades Pongwiffy to advertise...but the only asistant who answers is a hamster. What's a witch to do? Forget about finding a new slum! How can Pongwiffy cope with a gang of Goblins, a sassy rodent assistant, and the Witches' Coven, who are waiting for an explanation? 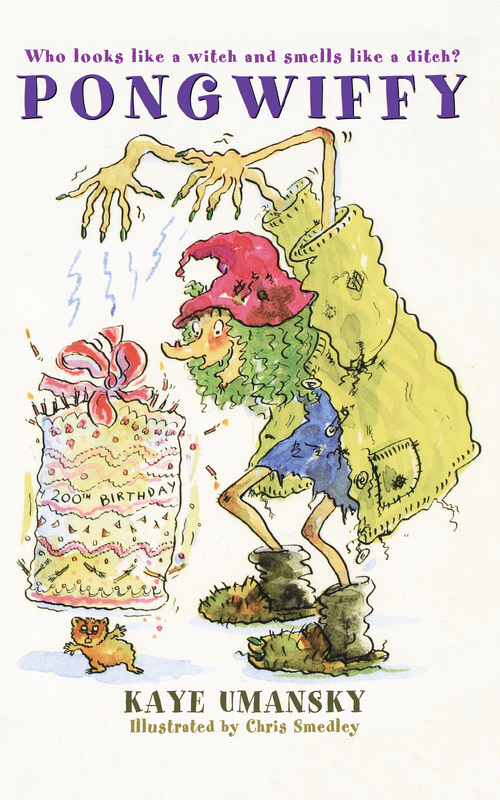 Even worse, she's responsible for Sourmuddle's 200th birthday cake. What will happen if Pongwiffy messes that up? "Witch Sharkadder! My old friend!" cried Witch Pongwiffy, opening the front boulder with her very best welcoming smile firmly fixed in place. "What a lovely surprise. Welcome to my humble cave. My, you do look nice. Is that a new hairdo, or have you had some sort of terrible shock, ha ha? Just my little joke. Come in, come in. Let me take your hat." She seized the tall hat, gave it a respectful little brush and waited until Sharkadder?s back was turned before booting it into a dark corner. "It?s hardly a surprise if you knew I was coming," remarked Sharkadder coldly, advancing into the cave. "I know you want to be my friend again, Pongwiffy, but I?m not at all sure I want to be yours. Do stop putting it on." There was no doubt that Pongwiffy was being revoltingly smarmy -- but it was for good reason. You see, she and Sharkadder were usually best friends, but they had recently had one of their quarrels, and Pongwiffy was anxious to make amends. "Oh, you're not still thinking about that silly old quarrel are you? Come on, Sharky, let bygones be bygones. Have a look at my new cave. I only moved in last week. You're my first guest." Pongwiffy's cave wasn't a pleasant sight. It had shocking damp problems for a start. Slimy green moss grew on the walls, and the floor was a seat of muddy puddles. The broken-down furniture wasn't so much arranged as thrown in any old how. Thick black steam belched from the horrible looking slop which bubbled and glopped in the cauldron. "Well, sit down, Sharky, make yourself at home," fussed Pongwiffy, removing Sharkadder's cloak and dropping it into a slimy pool. "There's nowhere to sit," observed Sharkadder truthfully. "You'll have to use that cardboard box. I haven't sorted the chairs out yet. That's the trouble when you've just moved in. It takes ages to get organized, doesn't it?" "You've never been organized," said Shark-adder. "What's that terrible stink? Smells like dead skunk." "It is," said Pongwiffy cheerfully. "It's tonight's supper. My specialty. You'll love it. Skunk stew. I'll just give it a stir," and she took a large ladle and poked at the heaving goo in the cauldron. "Oh," said Sharkadder, wishing she'd stayed at home. "Skunk stew. Really?" "I knew you'd be pleased," said Pongwiffy. "Now, tell me truthfully. How do you like the cave? It's a little damp, I know, and perhaps a bit small, but it was very cheap. Of course, it's a nuisance being in Goblin Territory, but I can't afford anything better at the moment. What do you think of it?" "It's a dump," said Sharkadder. "It's a smelly little slum. It's not fit to live in. It's squalid and yucky. It's the worst cave I've ever been in. It suits you." "It does, doesn't it?" agreed Pongwiffy, pleased. "I feel it's me. It's a pity about the Goblins, though. I'll tell you about them later. Now then. How much stew for you, Sharky?" "Er -- about half a teaspoon," said Sharkadder hastily. "I had a huge lunch. And I think I've got a touch of tummy trouble. And I'm slimming." "Nonsense," said Pongwiffy, relentlessly approaching with a huge, greasy plateful. "Get that down you. You don't need to slim. You're beautifully thin. You could model rags with that figure. And that's a lovely perfume you're wearing. Don't tell me -- let me guess. Night In a Fish Factory, right? And I do so like the new hairstyle. It really suits you. Brings out the beakiness of your nose." "It does, doesn't it?" agreed Sharkadder, finally coming around after such an onslaught of flattery. She scrabbled in her bag, took out a small, cracked hand mirror and examined the frazzled mess with satisfaction. "I've got some new hair rollers," she explained. "Little hedgehogs. You warm them up. Not too much, or they get bad tempered and nip. Just enough to send them to sleep. Then you wind the hair around, and wait for them to cool. And it comes out all curly, like this." "Beautiful," nodded Pongwiffy through a mouthful of stew. "You always look so nice, Sharky. I don't know how you do it." "Yes, well I do try to take care of myself," agreed Sharkadder, tossing her tangles and applying sickly green lipstick. "You'd look a lot better yourself if you washed once in a while. And changed that disgusting old cardigan." "What's wrong with my cardigan?" asked Pongwiffy, clutching the offending garment to her bony chest. "What's right with it? It's got holes. It's got no buttons. You've spilled so many droppings down it, you can hardly see the pattern. It looks like it's been knitted with congealed egg. Want me to go on?" But it was true. Pongwiffy's sense of personal hygiene left a lot to be desired. "As for those flies that buzz around you all day long, it's time you swatted them," added Sharkadder, enjoying herself. "Swat Buzz and Dave? Never!" declared Pongwiffy, aghast at the idea. She was fond of her flies. They circled around her hat, shared her food, and slept on her pillow at night. "Look, let's not talk about flies and cardigans. You'll never change me, Sharky. I like the way I am. Try some stew. I made it specially." "I can't. I haven't got a spoon," hedged Sharkadder. "What on earth do you need a spoon for? Slurp it from the plate, like I'm doing," said Pongwiffy, demonstrating. "No, I want a spoon," insisted Sharkadder. Pongwiffy sighed and went to the sink. Sharkadder watched her crawl under the table, duck under the cobwebs, heave a heavy wardrobe to one side and kick a dozen cardboard boxes out of the way. "I don't know how you bear it," said Sharkadder with a shudder. "Don't you ever tidy up?" "Nope," said Pongwiffy truthfully, retracing her route with the spoon. Sharkadder eyed it with a critical frown. "It's dirty," she observed. "What's all this crusty stuff?" "Last week's skunk stew," explained Pongwiffy. "No point in washing it, seeing as we're having the same. Now, what was I going to tell you? Oh yes. My new neighbors. You see..."
"I want a clean spoon," interrupted Sharkadder. The strain of being a polite hostess was suddenly more than Pongwiffy could bear. "Honestly!" she shouted. "You're such a fuss-pot sometimes. I go to all the trouble of inviting you for supper, and all you do is..."
Just at that moment, there came an interruption. There was an ear-splitting crash, and the walls shook. The Goblins in the cave next door had arrived home. You should know quite a bit about the Goblins Next Door, because they feature rather a lot in this story. The Goblins Next Door consisted of a whole Gaggle. A Gaggle? That's seven Goblins. These were called Plugugly, Stinkwort, Eyesore, Slopbucket, Sproggit, Hog and Lardo. They moved in a week ago, about the same time as Pongwiffy, and they had already caused her no end of aggravation. This seems a good time to tell you a little about Goblins in general. Then you can decide for yourself whether or not you would care to live next door to them. The most important thing you should know about Goblins is this: they are very, very, very stupid. Take the business of their hunting night -- Tuesdays. That's when they hunt. It's Traditional. Whatever the weather, every Tuesday they all troop out regardless and spend from dusk till midnight crashing about the woods hoping to catch something. They never do. It's common knowledge that the Goblins are out on Tuesdays, so everyone with any sense stays safely indoors and has an early night. The Goblins are always surprised to find the woods deserted -- but they'd never think of changing their hunting night to, say, Thursdays, thus catching everyone unawares. That's how stupid they are. Of course, you could forgive them their stupidity if they weren't so generally all around horrible. Painting Their Traps Bright Red; Bellowing Loud Hunting Songs While Walking on Tiptoe; Stomping Around in Broad Daylight with Faces Smeared with Soot so they won't be noticed; Wearing Bobbly Hats, even in a heat wave, To Stop The Brains Freezing Up; Cutting the Traditional Hole in the Bottom of the Hunting Bag, so that whatever goes in immediately falls out again. Right, that's enough about Goblins in general. Let's now get back to the Gaggle in the cave next door to Pongwiffy. All Goblins are great music lovers, and Pongwiffy's new neighbors were no exception. They kept her up to all hours, playing ghastly Goblin music at very high volume. Now, Goblin music sounds rather like a combination of nails scraping on blackboards, burglar alarms, and dustbin lids blowing down the road, so you see what she had to put up with. It was most unfortunate, then, that the Gaggle next door chose the very night that Pongwiffy was entertaining Sharkadder to supper to hold their Official Cave Warming Party. 1 Tribe makes life unbearable. The Gaggle next door had invited no less than two entire Tribes to their cave warming -- and that, if you can't work it out for yourself, is eighty-four Goblins! They all arrived at the same time, singing. Can you imagine? they howled joyfully, pouring into the cave. Next door, Sharkadder leaped from her cardboard box, sending the plate of Skunk stew crashing to the floor. "My new neighbors," explained Pongwiffy, scooping the spilled stew onto her own plate. "I'll eat this if you don't want it." warbled the Goblins relentlessly, stomping around in their hobnail boots and beating their warty heads against the wall. A small avalanche of stones rained down on Sharkadder's new hairdo. A large spreading crack indicated that the ceiling was about to fall in. "Stop them! Stop them making that dreadful noise!" howled Sharkadder, trying in vain to protect her curls. droned on the song, and Pongwiffy's favorite poison plant keeled over and died on the spot. Then the ceiling did fall in. There was a groaning, grinding noise, and down it came with a huge crash, burying both Pongwiffy and Shark-adder under several tons of rubble. Luckily, they're Witches -- and Witches are tough. "Sharky? Where are you? Are you all right?" called Pongwiffy, crawling out from under a large slab of granite and peering through the murk at the fallen boulders littering the floor. There was a moment's silence. Then, the overturned cauldron gave a heave, and Sharkadder emerged, shaking with fury and covered from head to foot in Skunk stew. "Oh dear," said Pongwiffy. "Sorry about that." "I'm never speaking to you again, Pongwiffy!" hissed Sharkadder, and ran weeping from the cave. Pongwiffy picked her way through the rubble and staggered out, gasping for air. She was just in time to see Sharkadder mount her Broomstick, which was saddled outside, and zoom off, splattering the treetops with Skunk stew and screaming shocking curses. Pongwiffy's own Broom was propped where she had left it, fast asleep as usual. Pongwiffy marched up to the Goblins' front door, which was, to be exact, their front boulder and rapped sharply. There was a sudden pause, followed by muffled mutters of: "Fink dat's Uncle Slobbergum?" "No, he's already here." "Where?" "In de soup. He just fell in it." "See who it is, Stinkwart." "Where's Plugugly? Answering the boulder's his job..." and so on. Finally the boulder rolled back, and Pongwiffy found herself staring into the repulsive, lumpy countenance of Plugugly, the biggest Goblin. "Yer?" he growled, scratching unpleasantly and glaring at Pongwiffy with small, red, piggy eyes. "How many more? How many more verses to that wretched song?" demanded Pongwiffy in a shrill voice. "Derrrrrr..." Plugugly thought deeply, his brow creased in concentration. Maths wasn't his strong point. "Wait dere," he said, and vanished to confer with the others inside. Pongwiffy tapped her foot impatiently while the whispered arguments went on, and grimly fingered the Wand which hung on a dirty string around her neck. Eventually Plugugly returned. "Over my dead body," Pongwiffy said. "If you like," Plugugly said, leering. "Do you realize," snapped Pongwiffy in her firmest, no-nonsense voice. "Do you realize that you have brought my ceiling down? You've quite ruined my supper party. You've upset my stew, not to mention my best friend. I haven't slept a wink for days -- not since you moved in. Every night I have to listen to your caterwauling. There's a limit to my patience. Who d'you think you are anyway?" "Goblins," said Plugugly with the confidence that comes from having the body of a bolster topped with a face like an old, squeezed tea bag. "Goblins. Dat's what we is. And we does what we likes." "Oh you do, do you? And suppose I put a spell on you, and banish you from this cave?" Pongwiffy produced this ace from her sleeve with an air of triumph. "Derrrrrr...wait dere," ordered Plugugly, and retreated inside again. Pongwiffy waited. After a few moments, he returned. "You better come in," he said. "Yer." It was grim and gloomy in the Goblin cave. The air was thick with dense smoke curling from the torches jammed into crevices in the walls. There was an overpowering smell of Goblin, which threatened to overwhelm even Pong-wiffy's own personal odor -- and that's not easy, as you would know if you ever stood downwind of her. Holding her nose, she peered around. One hundred and sixty-eight small, red, piggy eyes peered right back at her. Everywhere she looked, there were Goblins. They sneered from the shadows, scoffed in the corners and gibbered and jeered in the gloom. Some wore the Traditional Goblin Uniform, which is baggy trousers held up with braces, and, of course, the time-honored bobbly hat. Others wore stolen leather jackets dripping with chains and studs. These were members of an outlaw Goblin brood from a grotto high in the Misty Mountains. They called themselves the Grottys, and would dearly have liked to own motorbikes. So far, however, they only possessed one rusty tricycle between them which they took turns falling off. There were lizardlike, scaly Goblins, grossly fat Goblins, hairy Goblins, bald Goblins, drooling Goblins, scraggy little weasly ones with long noses, tall spindly ones with short noses, and Goblins with humps, lumps, and bumps in the most surprising places. All of them wore huge boots, all had small red piggy eyes, and all looked and smelt as though they had crawled out of a blocked-up drain. "Roight, boys!" said Plugugly. "Bit of 'ush if you please. Our neighbor wants a word. Yer." The Goblins sniggered and nudged each other. "Yes," said Pongwiffy severely. "I do. I'm getting very tired of you lot. In fact, I'm not putting up with another minute of it. You've brought my ceiling down. My best friend's not speaking to me and my hot water bottle's punctured. It's a disgrace. In fact, I'm seriously thinking of casting a Spell of Banishment on you. What do you say to that, eh?" To her surprise, none of the Goblins looked the least bit worried. In fact, several of them tittered. One even yawned. "So I'm warning you now," continued Pongwiffy uneasily. "Any more noise, and that's it. Whoosh, gone, the pack of you." "Let's see yer do it," croaked Slopbucket, sidling closer. "Her her her. Yer, let's see yer do it!" was the general cry. "I will!" threatened Pongwiffy. "I will, too. Unless you promise to remove your boots and whisper from now on. Do you?" "NO!" came the howled chorus. "NO! NO! NO!" And they cheered and began a slow hand clap as Pongwiffy seized her Wand and held it aloft. Now, that was very odd, for a Witch's Wand is guaranteed to put fear into the heart of any Goblin. Brutes, bullies and thorough-going pests that they are, they have one disadvantage, apart from being stupid. They Can't Work Magic. Pongwiffy gave her wand a little shake to make sure it was working. Green sparks crackled at the tip and it began to hum. All was well. "Here I go! One Banishing Spell coming up!" And she began the chant. 'Long as they're not here, but there! Nothing happened. The Goblins nudged each other, grinning. Pongwiffy frowned at her Wand and tried again. Still nothing. Then she became aware of wheezing chortles and horrible strangled snorting noises. The Goblins were laughing! They fell about, digging each other in the ribs and hooting with mirth. "I don't understand it," mumbled Pongwiffy, staring aghast at her Wand, which had ceased to spark, or even hum, and had a knot in it! "It's always worked before..."
"It's quite simple, really," explained Plugugly, mopping his streaming eyes. "It's like this, yer see. We bin banished already! To this 'ere cave. So you're stuck wiv us. Har har har!" "True as I'm standin' 'ere, ain't it, boys? It were a Wizard what done it. At our lass place. 'E comes complainin' about the noise, see, just like you. We gives 'im a bit o' lip, see, an' in the end 'e declares us a -- what were it again?" "Public Nuisance!" roared the Goblins with great pride. "Yer, dat's it. Public Nuisance. So 'e gives us the boot 'n banishes us 'ere. An' 'ere we gorra stay. Fer ever. So your feeble ole spells won't work!" Which was true. Wizard Magic is strong stuff, and not easily undone. "Her her her," wheezed Plugugly, shoulders heaving. "Worra laugh ain't it, eh?" "No," snapped Pongwiffy coldly. "It isn't." "Tell yer what, though," continued Plugugly. "We can come to a -- wassit called again?" "Yer, dassit. Compromise. You don't come around 'ere again complainin', and we won't smash yer place up. 'Ows that sound? Reesnubbo?" It didn't sound reasonable at all. Pongwiffy glared into his grinning, stupid face and debated whether to punch him on the nose or move out the next day. She moved out the next day.